So to celebrate this special release, we are giving away a $30 gift certificate to THREE lucky winners! Please leave a comment here on the Altenew Scrapbook Blog for a chance to win. The winners will be announced on Sunday, June 25th. For another chance to win please click here and leave a comment on the Altenew Blog. As this is the Altenew Scrapbook blog I have made a layout using this amazing set. I only used the outline stamp which I stamped using Permanent Black ink from Altenew. Then I added some color using Mountain Mist and Lagoon Crisp ink. These two colors were also used to create the splatters. For the leaves I used Mountain Mist and Morning Frost crisp ink. Cutting them out was really easy with the die. You can see how the whole layout came to together in the video below or you can watch it in HD on YouTube. Two beautiful projects! I LOVE that phrase you both used. Such beautiful pages! Love your use of the large flowers & the simplicity of the designs! Beautiful layout! This is an amazing set! Thanks for sharing such lovely layouts using the new build-a-flower release. This new stamp works so well on these scrapbook pages–and the card possibilities are great, too. Oh my stars! Those flowers are REDONKULOUS!! (Renoculous are my fave!!!!) SUPER love them on those layouts! Wow! So pretty-love the butterfly add! You did it again! What a beautiful flower stamp and die! I love how versatile it is! Keep up the good work! I love this new flower set. Enza’s page is so beautiful, too. I am thrilled with the build a flower sets you have come out with. And, this one is awesome. They all are “I must haves!” Thank you for your beautiful and wonderful creations. Another great build-a-flower set…..gotta have. Two lovely layouts! Thank you for sharing your design process. Love the layout with this stamp. The layout is very creative. Cards are easy for me but layouts are harder.Thanks for the ideas. 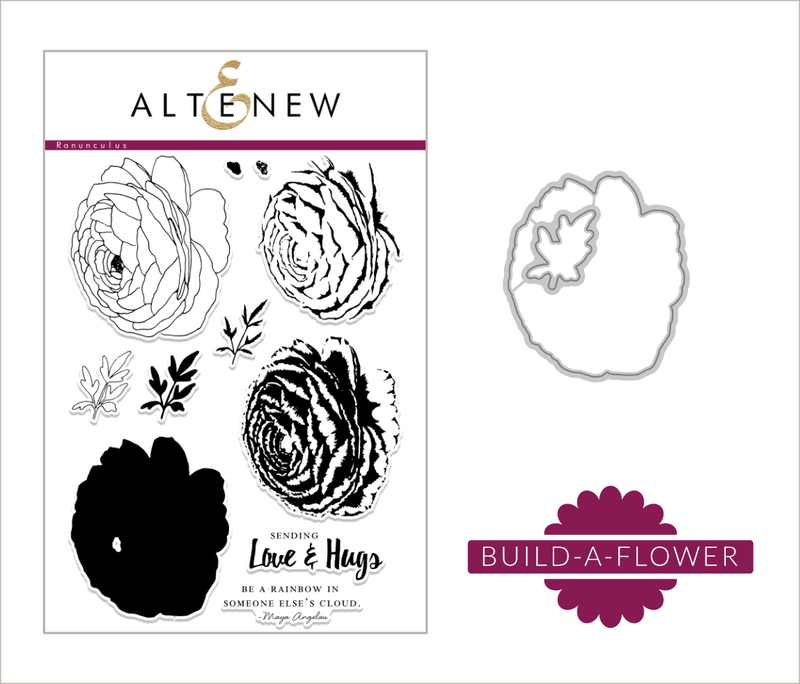 Great large floral stamp set for layouts and love the two with all the creativity of your designers! This would be so versatile with so many possibilites for scrapbooking! Beautiful layout and page, I love the loose watercoloring and splatters! Thanks for an awesome video too. Wow, both layouts are so lovely! The aqua matches up to the clothes he is wearing and the splatters are a great add! Beautiful layouts 🙂 The colors used by both of you are gorgeous! You guys make layouts look so easy! Beautiful layout! Lovely flower stamps & dies! Great layouts, the flowers are beautiful. I’m so glad you’ve started a scrapbook blog. I really need to get back to all my scrapbooks that I’ve neglected for the past couple years. My grandchildren will be thrilled to see new pages in their books. Thanks for all the great inspiration. Love the Ranunculus flower stamps and dies. Every time Altenew puts out something new I want it. My budget just goes away. You did such a beautiful layout and it was relatively easy to do. Thanks for showing us the techniques. I’ve been a card-maker for MANY years now & I always need new & exciting ways to work on my cards. I simply LOVE this flower stamp set! What a great stamp. The layouts are beautiful. Such a beautiful flower! I love seeing examples of it being used on layouts. Makes it so much more versatile. Stunning ! Just had to have this to share with those I love. Terrific layouts! I love how the ranunculus image was used in each layout. Lovely flowers. Each one in this series gets prettier than the next. I love your layouts. This is a fantastic stamp. Beautiful layout. I love the simplicity of it. Love the diagonal design of the layout. Thanks for the inspiration. Such a beautiful flower if I could pronounce it correctly. Your work is beautiful! It really inspires me to make my own artwork. Thank you! Loved the layout. Very impressed with this set. Ranunculus is my second favorite flower. Beautiful! These flowers can be used with so many mediums. Love the set! Beautiful stamp set and lovely layouts! The stamp set is beautiful! I can think of so many ways to use this set. I wish the tutorial went more in-depth on how to use a Build-a-Flower stamp set instead of just using one of the stamps in the set. I just love these layered stamps. what a lovely flower! fun, fun!! this is amazing. i love how the layering works to give a perfect dimention and real life to the flower! I love how these stamps layer so beautifully. Gorgeous layout–love the ink color you used! Altenew has such wonderful products. Thanks for inspiration on what we can do with them! Gorgeous set,and fabulous inspiration as always, this set is going to the ever growing wish list, thanks for all you share!